At Lutz & Associates, P.S., in Tacoma, Washington, our attorneys focus exclusively on family law. Why? We know that when our clients face a divorce or other family law issue or dispute, their lives become highly stressful. Consequently, our law firm's attorneys see it as our duty and our privilege to minimize our clients' stress to the greatest extent possible while resolving their issues in an expedient, cost-effective manner. In addition, our attorneys assist fathers in establishing paternity and families seeking to adopt. Our attorneys at Lutz & Associates, P.S., know that when deciding which law firm our clients want to represent them, it all comes down to who they trust to best represent their interests. Therefore, starting with their free initial consultation, we take the time to get to know clients personally, listen to their stories, answer all their questions, advise them of all available options, and then put our knowledge, skill, experience and dedication to work for them. Our pledge to our clients always has been and still is to go the extra mile to help make things right. In addition, we accept all major credit cards for our clients' maximum convenience in paying our reasonable and competitive attorneys' fees. 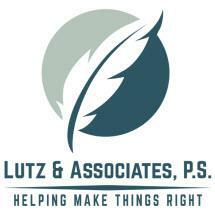 Lutz & Associates, P.S. has been knowledgeably representing clients in the Seattle-Tacoma area of the state of Washington since 1997. Family law situations can be a major source of stress in your life, no matter what area of family law you may have an issue with. The thought of filing for divorce can be very intimidating to many individuals. As part of your family law case, you may have questions regarding child support that you may be seeking or a support obligation that court may have ordered you to pay. Issues of custody and visitation can place a family in turmoil.